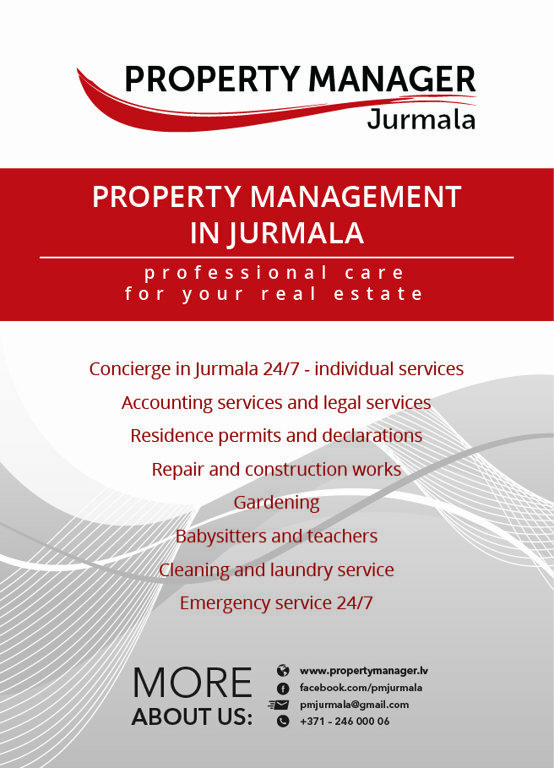 Property Manager Jurmala - professional care for your real estate in Jurmala, Riga, Marupe and all Latvia. Property Manager Jurmala is a property management company founded to offer services to foreigners who visit Jurmala and look for flat or house in Jurmala or in Latvia. Our aim is to save time, money and resolve possible problems. We make property management, renting, buying real estate in the Baltics easy and comfortable for our clients. Property manager Jurmala is your personal assistant in Jurmala and Latvia! Property Manager Jurmala works mainly in the EU and Russian markets and we would like to offer you cooperation in the sale of Latvian real estate properties. Our agency has a large data-base of real estate, both on the Baltic Sea coast of Latvia, and in the inland areas. In the field of real estate sales, we have been working since 2005. The whole process of buying a property we accompany - starting from a meeting of the client at the airport, placing in the hotel, inspecting the property and signing a contract for the sale of an apartment, as well as providing legal support for the transaction. I hope that you will show interest and we will have beneficial cooperation together in the future!